SFA’s mission is to defend, protect and enhance the commercial fishing industry in the southeastern United States for present participants as well as future generations through all legal means while maintaining healthy and sustainable stocks of fish. Early Bird Registration Prices End April 16th!! The South Atlantic Fisheries Management Council is seeking applications four several opening on their advisory panels and workgroup. The available seats are for the Habitat Advisory Panel and the Systems Management Workgroup. The applications are due May 10th, 2019. April 17; Palmetto, FL; Segment Two course for one full day (8AM-5PM). 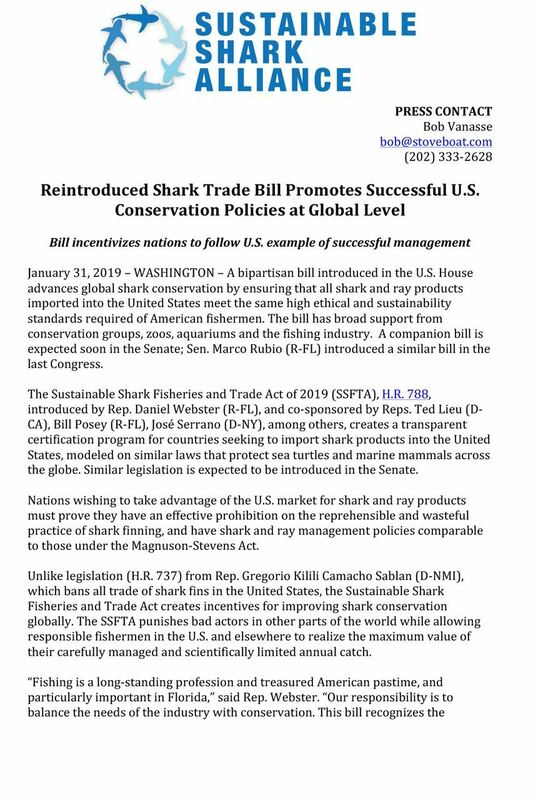 SFA is urging member and Florida residents to contact Senator Rick Scott and tell him to support the Sustainable Shark Fisheries and Trade Act fo 2019. The bill, introduced by Senator Rubio in the Senate as S. 1008 and Representative Daniel Webster in the House as HR. 787, promotes ethical and sustainable shark fishing procedures and allows American fishermen to continue making a living. Click the link below to download information about the bill and how to Contact Senator Scott, and tell him to support fishermen! The 2019 commercial red snapper season opens at 12:01 a.m., local time, July 8, 2019. The 2019 recreational red snapper season opens at 12:01 a.m., local time, on July 12, 2019, and closes at 12:01 a.m., local time, on July 15, 2019; then reopens at 12:01 a.m., local time, on July 19, 2019, and closes at 12:01 a.m., local time, on July 21, 2019, unless changed by subsequent notification in the Federal Register. Please help to keep Southeastern Fisheries Association fighting for the future of the commercial seafood industry and YOUR access to seafood - the cleanest, safest protein in the world. Partner with us by becoming a member. Preserve harvesting access to the marine fisheries resources for future generations. There are worldwide efforts to reduce the harvest of seafood and to reduce the number of fishing vessels and fishermen in the industry. One major effort of reduction is in fisheries identified as overcapitalized. Another effort is being made by groups who are opposed to harvesting animals for food purposes. Promote and deliver continuing education programs concerning seafood safety. There is a worldwide concern about seafood safety, so much so that the United States, Canada and the European Economic Union have initiated strict seafood safety regulations. The US Food and Drug Administration (FDA) established 21 CFR 123 in 1996 as the controlling regulations for all seafood and aquaculture products sold at wholesale in the country. SFA is developing new options for those needing to be HACCP-certified. Chronicle the history of the southeastern seafood industry. Manuscripts, rules and regulations show how the seafood industry in the southeast has been transformed from a valuable and respected industry to an industry considered by some groups as no longer needed. Treasurer: Sherri McCoy, Cape Canaveral Shrimp Co.
Dennis Henderson, Trico Shrimp Co. Images and Content Copyrighted, 2019.